~Maranatha! 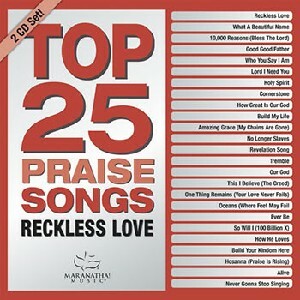 Music introduces the newest addition to its successful Top 25 series: Top 25 Praise Songs - Reckless Love. The latest release in this signature brand features the most popular praise & worship songs from acclaimed songwriters including Chris Tomlin, Brooke Ligertwood, Louie Giglio, Ed Cash, Leslie Jordan, Brian Johnson and Matt Redman. These are the TOP songs being sung in the church today, recorded in arrangements and keys that are easy to sing!